For many people, a relaxing car drive is a great way to reduce stress and revitalize the spirit. Unlike driving to the office in rush-hour traffic or car pooling the kids to soccer practice, a relaxing drive can calm your mind and leave you feeling refreshed, as if you took a mini vacation. Magnificent mountains, bucolic country scenery and mesmerizing seascapes are only a few of the spectacular views awaiting you as you explore country roads and drive the highways and byways experiencing the scenic wonders of nature. Throughout the United States, each state has its own unique beauty and natural wonders. Breathtaking scenery, intriguing landscapes, historical places and picturesque towns make your drive a relaxing, memorable time. Exploring areas that are new to you, or visiting old favorites, are wonderful ways to unwind. 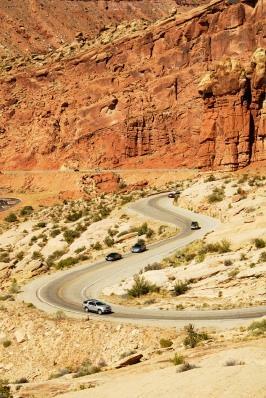 The following roadways are considered some of the most scenic in the United States. The Blue Ridge Parkway which runs from North Carolina and Virginia over the Appalachian Mountains. Route 100 in Vermont has spectacular viewing of the changing colors of the fall foliage, but is beautiful all year round. The Custer Scenic Byway of South Dakota runs through the Black Hills. Minnesota's North Shore Drive runs along the shore of Lake Superior on one side and the Sawtooth Mountains on the other. The Black Bayou Drive in Louisiana runs through moss laden live oak trees, sugarcane fields and swamp country. Part of the byway is a section of the Old Spanish Trail from the 1800s. Highway 1 is a scenic wonderland as it follows the California coast from Morro Bay to Monterey. The Beartooth Highway offers majestic mountain views in Wyoming and Montana. Utah's Zion National Park Scenic Byway features rock formations and shapes richly colored by manganese and iron. The Internet has many excellent websites dedicated to sharing information on relaxing scenic roadways. Find the byways and backways of any area of the United States at Byways. The Blue Ridge Highlander offers directions and descriptions of 19 scenic road trips through the mountains. There are many scenic drive suggestions from Yahoo Travel. Choose the state from the list at Scenic Drives USA to find suggested scenic drives and back roads. The top ten scenic drives in the United States chosen by Sherman's Travel. When you do not have a lot of time, or gas prices are keeping you close to home, you can still take a short drive to relieve the stress of everyday life. Whether you are planning a day trip, an extended driving vacation or only have a few hours of leisure time, enjoying a relaxing car drive will leave you feeling refreshed, relaxed and ready to face the stress of daily life.